Tone your pelvic floor and enjoy delicious internal stimulation with the Fifty Shades of Grey Beyond Aroused Kegel Ball Set. With 6 different weight combinations for progressive training, strengthen your pelvic floor and enjoy easier, stronger orgasms. Order over the phone: Call 07 3053 8518 and quote code 52427. With 4 individual ball weights to play with, it's easy to start at a level that's comfortable for you to progress through a full regime without buying new equipment. Over time you'll feel the benefits of stronger muscles. Not only will you find progressing through heavier weights easier and easier, but you'll enjoy stronger, more frequent orgasms and your lover will notice a newer, tighter you. Wear them for extended periods of time, starting off for just 15 minutes at a time and progress to longer periods of time as you get stronger. When you're ready, take a step up in weight to increase the challenge. Still looking to intensify your workout further? 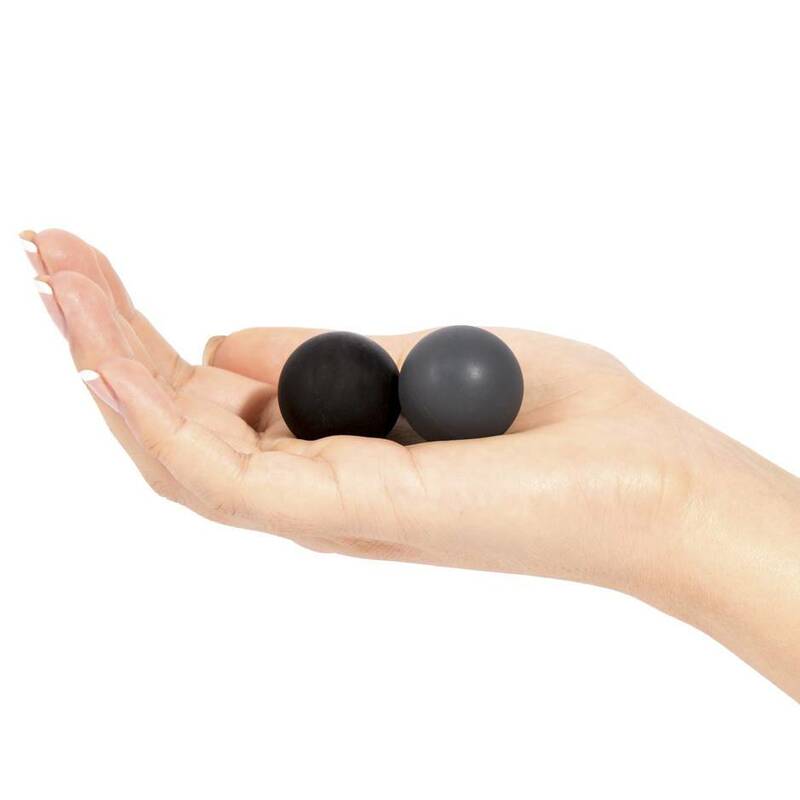 Wear a pair of balls without the cradle for ultimate kegel conditioning. All you'll need is a generous squeeze of your favourite water-based lube to get the most from these little pleasure balls. 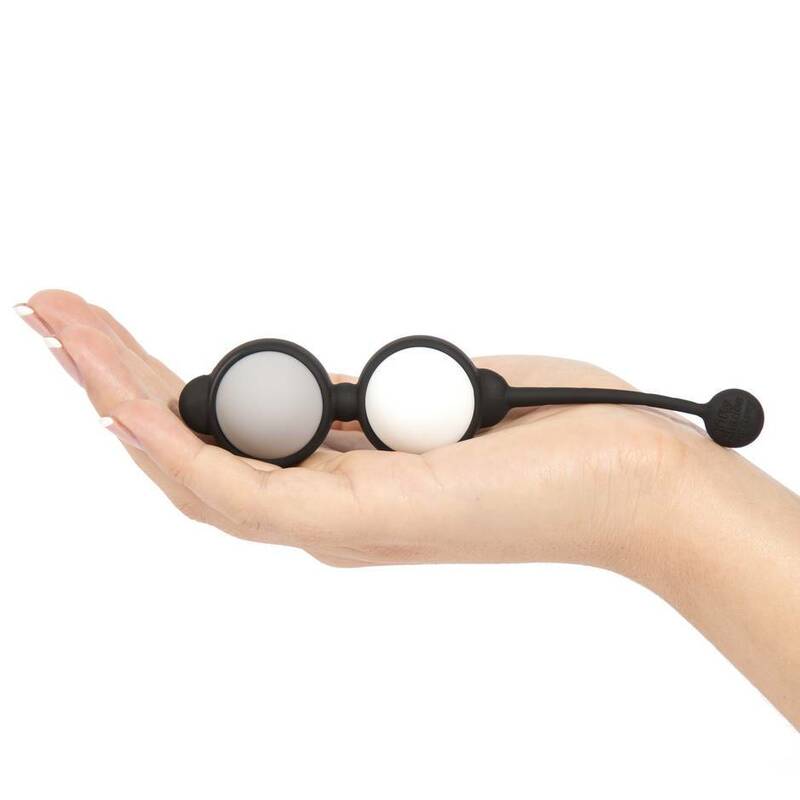 Tone your pelvic floor with the Fifty Shades of Grey Beyond Aroused Kegel Ball Set. Achieve 6 different weight combinations with individual ball weights of 15g, 25g, 35g and 55g for progressive training. Buy the best Kegel balls and learn how to get the most out of your new toy with our Love Eggs and Jiggle Balls Guides. I ordered these to help tighten my pelvic floor and boy do they ever! The shipping was so fast. I tried them straight away. I love that it comes with different weights and that you can customise the weights in the case. They are easy to clean and with a little lube they slip right in. I can feel them when walking around, so it does add a pleasurable experience while you are wearing them. Easy to insert, feels great. No cons they were great! Pleasurable and helps tone your pelvic floor! I am happy I decided to try this product, and have so far been extremely happy with it. This product is very smooth to the touch and easy to insert (with water-based lube of coarse). It turned out for me the lightest ball was a bit too light to be very effective for me, which wasn't a problem at all since there are 3 others to use in combination with each other. The balls looked a bit bigger than I expected when I first pulled them out, which I was a bit nervous about, but I found they are still super comfortable and easy to insert right of the bat. They are also super easy to clean. The balls are easily removable (although there is no worry that they will all of a sudden pop out while in use), and just as easy to pop back in when finished with the cleaning process. I personally use them as a Kegel exercise, not as a supplement to my "activities", and have found these work great while I am doing my morning getting ready routine. You can even keep them in while showering if you want to. I can definitely feel the muscles working, but they in no way get in the way while I go about what I need to get done, though certain movements can definitely cause "interesting" sensations when you aren't expecting it at first, but not in a bad way. I have only been using them for a short period of time so far, so I haven't noticed a huge difference in sensations during "activities", but I would definitely recommend this product. Interchangeable weights, easily cleaned, colour, effective, comfortable, good quality, short/sturdy connection between balls. Not really anything, might be nice if they made a "expansion" set for heavier balls. Definitely give them a try if you want a good set of Kegel balls. Every birthday and Christmas I always get my wife some fun presents. This was one of the things she asked for after reading up about Kegel balls. Initially she said it was an unusual feeling. However, after some use and the fact you can change the weights, she loves them. She always mentions once they are out she can always tell they have been there and she enjoys using them, be it daily use in the house, going to work or even having fun with in the bedroom! It’s definitely making a difference, and her orgasms have have strengthened after using these. It’s also feeling great for myself! Start off with the lighter weights and slowly build yourself up! Discreet packaging, nice little bag to store them in, different weights to build up. Great item to tone and tighten up for more fun in the bedroom.